I’m a little bit embarrassed. 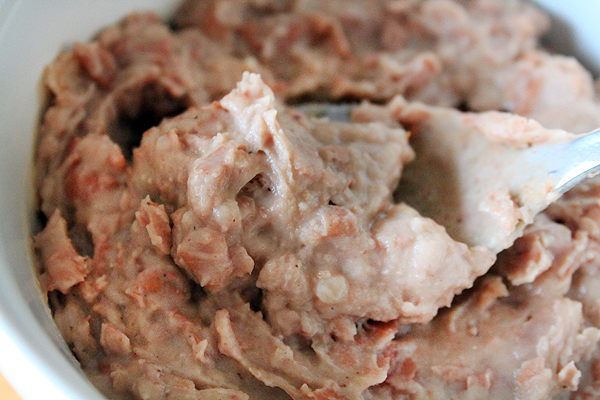 I’ve regularly purchased canned or freeze dried refried beans for years. Of course I knew on a high level that refried beans weren’t hard to make, but I still had a mental block that it was an added step on the way to tacos that I didn’t need to take. I feel pretty silly. For a start, the minute I started cooking the beans, my entire kitchen filled with the scents of every Mexican restaurant I’ve ever frequented in San Antonio – in other words, my kitchen filled with the scents of home. 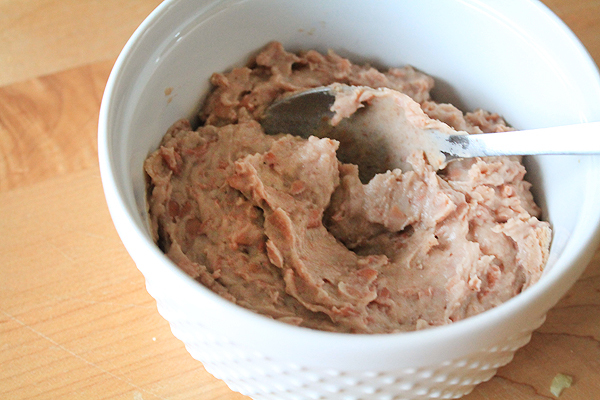 Making your own refried beans is way easier than you imagine. It honestly didn’t take me any longer than heating up canned refried beans would. And I got to customize the flavor in the beans to exactly my liking. Truth be told, they tasted more like restaurant refried beans than anything I’ve ever managed previously. If you want a true taste of Tex-Mex, skip the canned refried beans, and make your own. You still start with a can, but you can make them as spicy as you want, as garlicky as you want, and as creamy as you want with minimal effort. It’s worth that effort, trust me. In a medium bowl, empty one 15 oz cans of pinto beans. Do not drain liquid before adding. Use a large spoon or a potato masher to mash beans to desired consistency. Add garlic powder, onion powder, salt, pepper, and jalapeño if using, and stir to combine evenly. Heat a frying pan over medium heat. When the pan is hot, add canola oil. 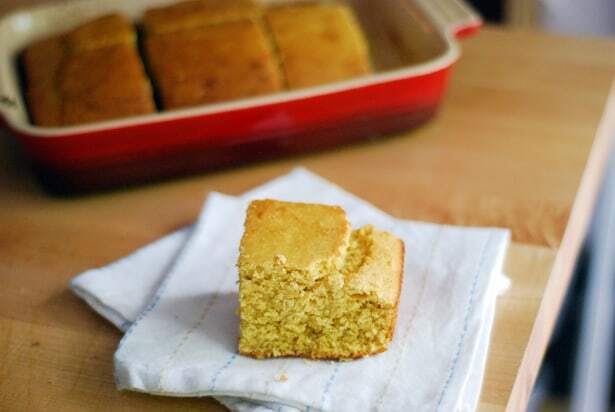 When the canola oil slides easily across the pan, add the bean mixture directly to the pan. Stir the beans immediately and often as liquid cooks down. If you’d like your beans to be creamy, stir in the half and half and allow to just heat through before removing from heat. Top with cotija cheese, then enjoy with fajitas, your favorite breakfast tacos, tostadas, quesadillas, or enchiladas. when making your own refried beans,, to get the ultimate flavor, add just one teaspoon of lard…..yes, lard…..that is what is used in the authentic recipe of the spanish people to get that fantastic flavor…..
Lard? You mean, like Crisco? To be used in the fried beans. Confession: I also have never made my own refried beans, although I have been thinking about it recently! These look so amazing, I am craving them like crazy now and it is well past 9 pm. Hmm… I have never made my own refried beans. I will give this a try very soon. I haven’t ever made refried beans! Tragic! I must fix that asap. Shelly, unless you want me to confiscate your Texan card, get to it! Alright, so this is where it becomes evident that we are not in fact long lost sisters. Beans and I are not friends. We are quite the opposite actually. It’s just…I can’t get past the feeling that the insides of beans are made of mushed up insects. I know. I completely totally know that this is insane. But, yeah. I can’t help it. Anyway! I’ve been trying realllllly hard to like refried beans and I’m slowly working my way up to eating a few bites here and there. Probably these are better than the freaky canned version I’ve previously tried. Okay, Karly, that IS weird. That was a brilliant comparison. I really did try for a moment to imagine that they were little potatoes, but no. I don’t think it’s helping. I’ll try to think of that next time I try eating them, though. Also, I’m really not THAT weird. I mean, you read about my strange post office phobia today and now you’re hearing about my bean phobia. I swear, that’s (mostly) it. I’m pretty normal. I also have a bean phobia….and i dont like corn..well anything that pops in my mouth when i eat it grosses me out. The only way i eat beans is refried! I’ve often wondered how this was done! Now I have to give it a try. If wanting refried beans for breakfast is wrong, I don’t want to be right. (Breakfast taco, anyone?) Now that I have the pressure cooker, I think I might take a stab at doing this with dried pintos. Will report back! Ah, but that’s the beauty of a pressure cooker – presoak beans overnight? Pshaw. PSHAW, I SAY. I’m about to go broke buying the Lays Hot Bean Dip; I had researched some recipes, but wondered how they got the skins of the beans out of them. After reading your post and looking a little closer at the last can of bean dip I had bought, I could see bits of the skin but they’ve just been ground up so fine as to not be readily visible. Doing some quick estimating, I reckon I can make two or three times the amount I’ve been buying for less than half the cost. Thanks f/ the recipe! Mike, that’s a great idea! I didn’t even think about that bean dip – with Fritos, of course! Let me know how it turns out! I loved your writing here, Amber, it’s obviously a subject close to your heart and home. Mmm, now I feel like putting on a pot of beans. Aimee, you should try making Borracho Beans – there’s a recipe here on the site. They’re called that because “Borracho” means drunk in Spanish. They’re made with beer, and the yeasty goodness adds some depth of flavor that are hard to rival!